Item Package Quantity:1 Item Package Quantity:1 Men + Health: Triple Action Men Testosterone Booster that balance the levels of Testosterone and Boost Naturally Men Virility and Libido. Vitality Support, Stamina drive. High Quality product made for active Men. Made with High Quality and scientifically proven Ingredients to Balance natural Men Testosterone level decreasing. Efficient when use daily. 40 capsules per Bottles. 4 serving. About the product 4 Good Reasons to take: 3-IN-1 BOOSTER - Get the VIRILITY BOOSTER by MAXIMENPILLS benefits! This one-of-a-kind formula includes powerful boosters formulated to support free t-levels, combat feelings of lethargy or loss of muscle mass, and give you the stamina you've been looking for. Healthy, Natural & CLEAN Booster - Not all supplements are created equal. To deliver the best results, our clean herbal formula contains zero gluten, preservatives, or animal products. Here, the Tribulus Terrestris, Yohimbine and Panax Ginseng Extracts in each vegetable capsule take center stage to help restore vitality and virility. BALANCE and LEVEL UP - VIRILITY BOOSTER by MAXIMENPILLS is formulated to pump up your energy levels and endurance. You don't have to be a bodybuilder or an athlete to see benefits! VIRILITY BOOSTER by MAXIMENPILLS is designed to help support a faster recovery time between workouts or intimate life activity. INTENSITY and ENDURANCE - Get your passion back. 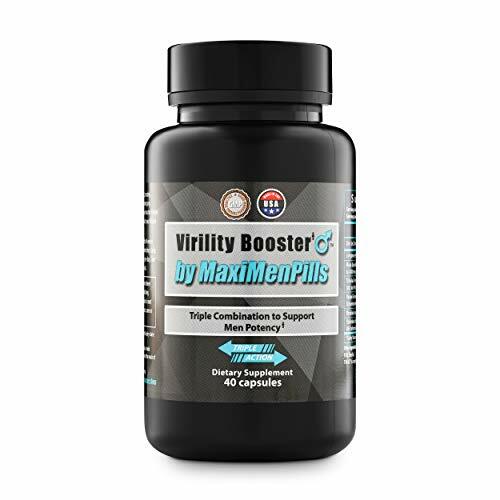 VIRILITY BOOSTER by MAXIMENPILLS is the most well-rounded formula on the market, stacking a powerful blend of ingredients. Trust us, you'll feel quickly.